Could you live with sacrificing one? Thats a very valid point, i think the answer is no, with DubMonkey trying to kill em all, I couldnt do it. The big bumpers look bestest, they do need the bottoms colour coding though. It's a problem, I cant stop buying stuff. Should have paid more attention to the kids from Grange Hill and learnt to 'just say no'. That is very nice !! Thats the only pic Ive got at the moment, it's off the ebay listing but rest assured I'll post some more up when I fetch it. I dont have that problem as she's as bad as me, we've only got this Golf because Liz wanted it, I was debating about it and she was sat there going on about how she liked it/wanted it/could see herself in it. So technically I suppose this ones hers, as is the Mk1 GTI and she also claims the silver Mk2 van is hers (it's not, it's mine). 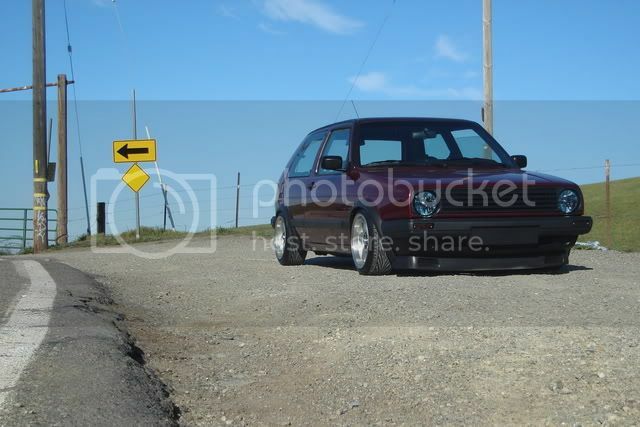 Was thinking about getting a mk2 to do it up quickly and sell it on to fund the caddy. Mk2s have been growing on me a lot lately (it's PaukMeisters fault), for ages I went off them for years because they went through a stage of being a bit non descript, they weren't a Mk1 but werent modern enough to be a 'new car'.